The Australian Terrier, affectionately called the Aussie, could be regarded as Australias and the dog worlds best kept secret. The breed was created in Australia, to fulfil the needs of the 19th century lifestyle. Not from any native dogs, but from dogs brought by the settlers. Although, no records were kept of the breeding that took place to create the Aussie, it is generally agreed the old Scotch Terrier, Dandie Dinmont, and the Skye Terrier were key founding breeds. The Settlers aimed to evolve a versatile dog which could outrun a rabbit; was sturdy enough to round up sheep and cattle; could catch and kill vermin; a good watchdog to protect livestock from predators and the homesteads from unwanted visitors. The Aussies were bred with these skills in mind. This resulted in the traits which make the breed distinctive like a coat to protect, not only from the undergrowth, but also the extremes in temperature and its prey. An agile dog with stamina, an even disposition, loyal and a great desire to please all topped with a sense of fun. Amazingly they developed the ability to kill snakes. They do this by leaping in the air and twisting to grab the snake from behind. This skill was a great asset and as the decades passed and more people went to Australia  families with children were advised to have an Aussie around the place. When Dog Shows started to take off in Australia the breed had a chequered history. They went through various names and met with a lot of criticism. Uncomplimentary descriptions like  unmitigated mongrel  were put in print. However, the breed has always had its supporters and enthusiasts that have cared and nurtured it. By 1894, the first Aussies started to arrive in the UK and by 1933 the first Club was founded and the KC recognised the breed. Since then the breed has travelled around the world and has found kindred spirits. The characteristics which made them ideal to help with the colonisation of Australia continue to make them versatile enough to be popular in the 21st century. Feature wise, they can be red, sandy or blue and tan. The ruff, apron and topknot make them distinctive, as is the longer back than many other terrier breeds. These traits are ideal to help them undertake the role for which they were bred. The coat is easier to care for than many other Terrier breeds, which appeals to the families who own an Aussie. They are great people dogs and many have a great affinity with children. The majority of Australian Terriers share their longevity with their owners simply as companions and pets. However, their biddable nature does mean they do participate in obedience, agility, flyball and heelwork to music, as well as gracing the show ring. So if you are looking for a dog with a great personality; a big dog in a little dog package; a dog with a sense of fun and enthusiasm for life and wanting to share their world with you. Consider the Aussie  the dog worlds best kept secret. Colour: The Aussie can be blue and tan, steel blue, dark grey blue, solid sandy, red or solid black. There can be a change in coat colour when the puppy is about nine months old. Age Expectancy: The Aussie does best as a house dog and can quite happily live until 14 years of age. Average Litter Size: Aussies will have 4 or 5 puppies in an averaged sized litter. Weight/Height Range: The Aussie stands at approximately 25.4cms at the withers and weighs approximately 6.34kgs. Personality: The Aussie is an intelligent, friendly little dog, that is very good at obedience and agility. They are very anxious to please and make good watchdogs. They are not yappy, as some of the small dogs can be, but will bark if necessary. They have to be trained quite strictly as they can do their own thing otherwise. They can be stubborn but they do love to please and revel in lots of human contact and praise. They are an active, outgoing and fun-loving breed. Intelligence: They are very intelligent little dogs that need firm training. They like to be kept busy, and if you do not give them something to do they will find something themselves. They have a great sense of fun and are enthusiastic about life. They are wary of strangers but in general are not too suspicious. If they are brought up with cats and young children then they can all live together quite peacefully. Overall Exercise Requirement: 80-100 minutes - These dogs require an adequate amount of exercise, but at the same time they are quite happy to fit in with your lifestyle. They are dogs that have a lot of energy and do enjoy nothing better than a good long walk. Grooming & Showing: An Aussie terrier in top condition will lose very little hair. They are easy to groom and have a weather resistant coat. These dogs should never be clipped and, if necessary should be plucked instead. They should be brushed and combed at least once a week and the ears checked for hair that may block the canals. Show Characteristics: The head should be long and strong with an alert expression. The nose should be black and the muzzle have an inverted V shape area, along the bridge of the nose (from nose to muzzle), with less hair. The jaws should allow a strong scissor bite, top teeth over bottom teeth. The eyes should be small, set well apart and be of a dark brown colour. The ears should never be cropped, and should be standing erect by four months of age. The neck should be long and blend into long shoulders. The legs should be well boned and muscular. The body is long in proportion to the height with a level topline. The feet should be small with tight toes. The tail is docked, to about two-fifths, and is carried erect but not over the back. The lower parts of the legs, the feet and the muzzle should have no long hair, the coat is harsh, straight and dense with a short, soft undercoat. They should be blue, steel blue or dark grey blue with a rich tan colour on the face, ears, feet and under carriage. The unacceptable colours are clear sandy, red or any dark shading. 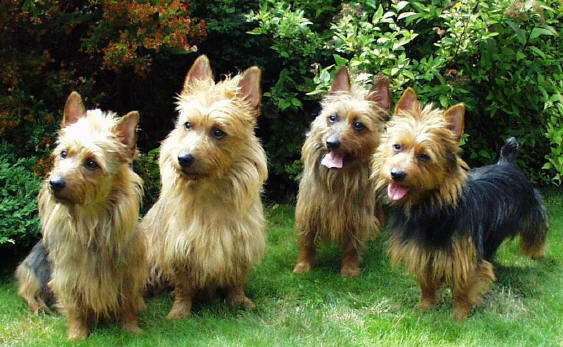 Breed Classification: The Australian Terrier is a member of the terrier group. They are small sturdy dogs, essentially used as working terriers, but can make excellent companion dogs. Today they are used in obedience and agility trials, but they also make great watchdogs and family pets.